Music composed in the Lambdoma scale is based on ratios. The Lambdoma keyboard begins with a fundamental, and then companion notes are precise ratios of the fundamental. In the image below, C is the fundamental at 256 Hz. 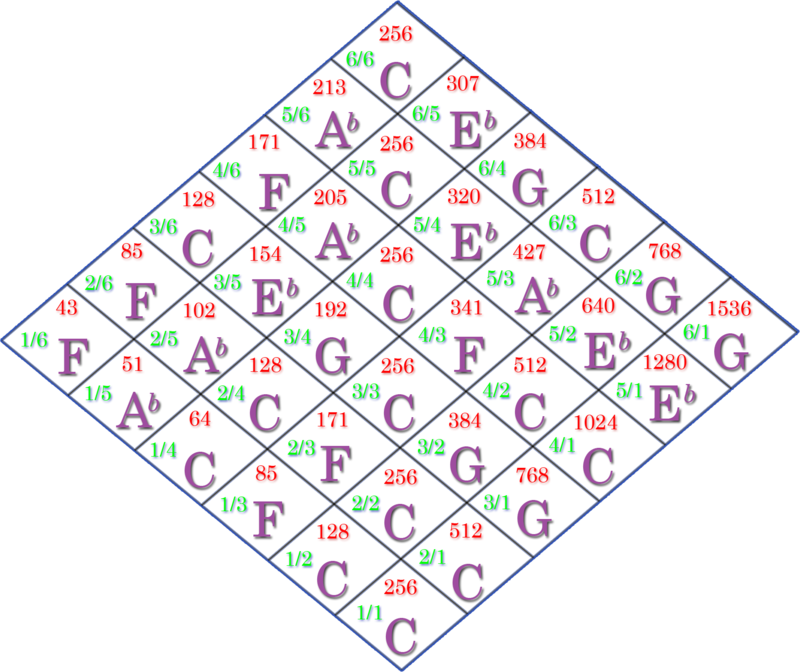 Notice that all the ratios of 1/1, 2/2, 3/3, 4/4, 5/5, and 6/6 factor to 1, which is the reference note to which all the other notes are tuned. The ratio 2/1 is one octave above the fundamental, and the ratio 1/2 is one octave below. The ratio 3/2 is G above the fundamental, and the ratio 2/3 is F below. The ratio 4/3 is F above the fundamental and 3/4 is G below. At first it would seem that the Lambdoma is identical to the tempered scale, such as the piano is tuned to. However, this is not the case. We can see the ratios 5/4 and 6/5 are both E flat, however 5/4 works out to a frequency of 320 Hz and 6/5 works out to a frequency of 307 Hz. The 6/5 ratio is harmonic with all the ratios with 5 in the denominator (X/5). The ratio 5/4, however, is harmonic with the ratios with 4 in the denominator (X/4). The ratios of 5/4 and 6/5 sound about the same, but each is slightly out of tune with the other families of notes. In the video below, I play a simple tune of harmonic notes in the first four families of ratios. Notice the symmetry of the notes. The same numerator pattern is played on each denominator row.